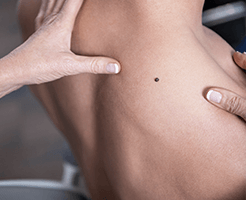 Most moles are benign and pose no cancer threat to the patient and don’t need to be removed. There are also some other skin lesions that are non-cancerous and don’t require removal either. Usually all of these lesions have been present for long periods of time and either have not changed or changed very slowly. However change in any lesions is cause for concern and should be checked by a doctor experienced in examining these lesions. The change can be in colour, size, shape, thickness, bleeding, and / or sensation. Patients would like a benign lesion removed for different reasons. They may be worried about malignant transformation, or the lesion may have become symptomatic as it catches or rubs on clothes, or they don’t like the cosmetic appearance of the lesion. Moles or other benign skin lumps can be excised with minimal margins. The lesion is cut out as an ellipse which ensures closure of the wound as a smooth flat scar but needs to be longer than the original lesion (2 or 3 times). Rarely when the lesion is too big the defect may need to be closed with a Flap or a Graft. A local Flap is when tissue from the same area is rearranged. A Graft is when a thin piece of skin is taken from another part of the body and transferred to reconstruct the defect. Dr Safvat is an expert at performing these “local Flaps” and Grafts, striving to leave minimal scaring and cosmetic or functional deficit.